Before and during the Meiji-era, there was no formal Gekiken training. You were supposed to learn Kenjutsu (swordsmanship) in a certain style, and then you can utilize what you've learnt to fence with other swordsmen. 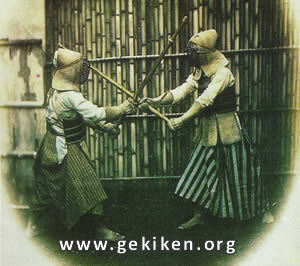 Gekiken was merely an environment for swordsmen of different styles to come together and cross-fence with each other. That being said, there are some styles which have sparring or fencing within the style itself. From historical illustrations and photographs, we can observe swordsmen in armour, and wielding their weapons in various stances. If we look closely at the footwork, we can see Shumoku-Ashi. Notice the back-feet pointing outwards, which is taught in many Koryu Kenjutsu (old-school swordsmanship), but this is discouraged in modern Kendo. On the right, is an illustration from Hokusai Manga. 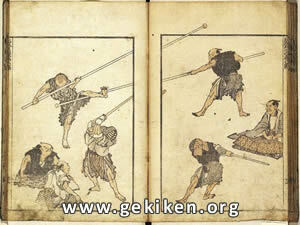 Instead of a straight-forward Jodan (high stance), the swordsman depicted in the illustration holds the sword high to the side, ready to deliver a Kesa-giri (diagonal cut). This stance can be found in Koryu Kenjutsu schools. After the Meiji-era, Japan entered into the Showa-era. Before WWII, there were many books on Kendo. In these books, the readers are taught to have both feet pointing forward, just like in modern Kendo. However, there are also techniques not found in modern Kendo, such as leg-sweeps, ground-fighting or grappling, and so on. After the end of WWII, Kendo was banned and later revived into what we know as modern Kendo today. Stances and training are standardized, and many techniques from Pre-WWII Kendo are no longer in use.